The 2X MCAmp library amplification master mix has been specially formulated to provide accurate and robust amplification of NGS (next-generation sequencing) library fragments. The 2X MCAmp library amplification master mix has been specially formulated to provide accurate and robust amplification of NGS (next-generation sequencing) library fragments. 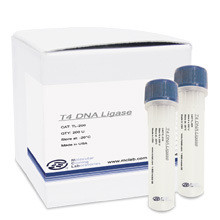 The master mix utilizes a proprietary combination of our ultra-fast, high-fidelity DNA polymerases. The polymerases all possess 3'->5' exonuclease (proofreading) activity with a processivity ten times greater than generic DNA polymerases. The reaction buffer has been optimized to provide robust amplification of library fragments even with low input and GC or AT rich sequences. The resulting amplifications have robust yield with high-fidelity, low PCR duplication, and low bias which produces greater and more uniform coverage especially in challenging genomic regions. 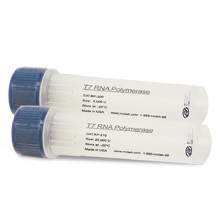 For Illumina® platforms, an optimized 10X Primer Set targeting the P5 and P7 sites is also available. High-fidelity: The master mix utilizes DNA polymerases that all possess 3'->5' exonuclease (proof-reading) activity for accurate nucleotide incorporations into your final products. High-efficiency: The polymerases in the master mix have ultra-high processivity so that less cycles are required for sequence ready libraries. Low bias and PCR duplication: Optimized buffer formulation to minimize amplification bias and PCR duplication. This results in a greater number of reads with more uniform coverage, helping to minimize cost and time. 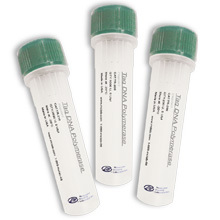 25 mM TAPS-HCl (pH 9.3 @ 25°C), 50 mM KCl, 2 mM MgCl2, 1 mM β-mercaptoethanol, 200 μM dNTPs including [3H]-dTTP and 400 μg/ml activated Calf Thymus DNA. Figure : Library preparation and amplification results from varying input quantities of sheared human genomic DNA. Library preparation and size selection (~350 bp) was carried out using MCLAB's Topomize DNA Library Prep Kit. All amplifications were carried out to eight cycles. A. Agarose gel image after library amplification and clean up showing stable size distribution. M: 100 bp marker. Lane 1: 100 ng input DNA. Lane 2: 50 ng input DNA. Lane 3: 25 ng input DNA. B. 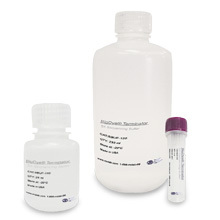 Average DNA yield of corresponding gel agarose samples determine by qPCR using MCNexttm SYBR® Fast qPCR Library Quantifiaction Kit.